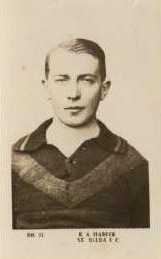 Wearing guernsey #17, Harper played 2 games for Carlton in his debut year of 1924. He played league football from 1919 to 1925 and played a total of 39 games without a goal. His other league clubs were St Kilda and North Melbourne. Harper was born in Byaduk, which is south of Hamilton, Victoria. He played at Hamilton College, then at Brighton Grammar prior to being recruited to the VFL. Harper passed away on the 10th March, 1935 aged 34. Contributors to this page: Bombasheldon , pblue , tmd1 , molsey , true_blue24 , dgreen2 , WillowBlue and admin . Page last modified on Sunday 02 of June, 2013 08:52:27 AEST by Bombasheldon. 1986 - Mil Hanna's injury battle.